As human beings, our basic needs are well, human. And so our ancestors also sought mastery in part at least of their environment. This becomes particularly important when we realise how the life and well being of their communities depended upon it. Hunting and fishing within these societies reflect cultural activities, often ritualised, that have distinguished humankind from the animal kingdom. And yet we retain an instinctive interconnectedness and relationship within both society and the natural world. This arcane and quite profound relationship between the hunter and the hunted links them essentially as one. Even clothing and weapons become imbued with the spirit presence of the animal and are thus assimilated one to another; no separation exists magically between the hunter, his tools and his prey. Where success is required, it is to magic they turn, utilising all available spells, charms and offerings to their totemic deity. Thus all magic becomes focused on the prey its self, to allow itself to be killed, or to be easy to find, to make the hunter invisible to it, and always to respect the spirit of the prey. What temper and what change has come o`er the delightful hunting-ground. While trapping, a maiden made rich my tract of wood, she made my beat abound with game. To take and not respect, to not [forfeit but accept in] gyfu [only]my life, will tilt the millstone, unbalance the order, and all abound will be cast in chaos. In the maidens hold, I hold my weapon’s in truth I ask no more, so I with chosen words beseech. I do not hunt on holy days, others may take by knavery, will take by fraud, I would not take by knavery, nor will I take by fraud. I only take that I have earned, I take with the sweat of my brow, I bring the best offering, I sing the best songs, thou are my shield under thee I sing. “In my own Craft, we firmly believe in the reality of ‘Utopia,’ a hope for the future. Never mourn the past; the lessons are there to see, where symbols retain the truth of this. It is for each of us to see beyond what we see, to discover the presence of myth beyond the drab and miserable illusion of what is presented as life. And so we come to the hunter, once a prince who is perhaps the earliest exemplar of the archetype we know and celebrate in myth and legend as Robin hood and herne too. November the 3rd. 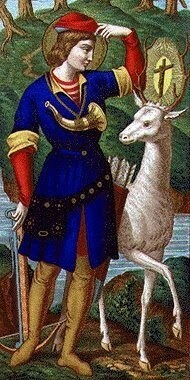 Feast Day of St Hubert. 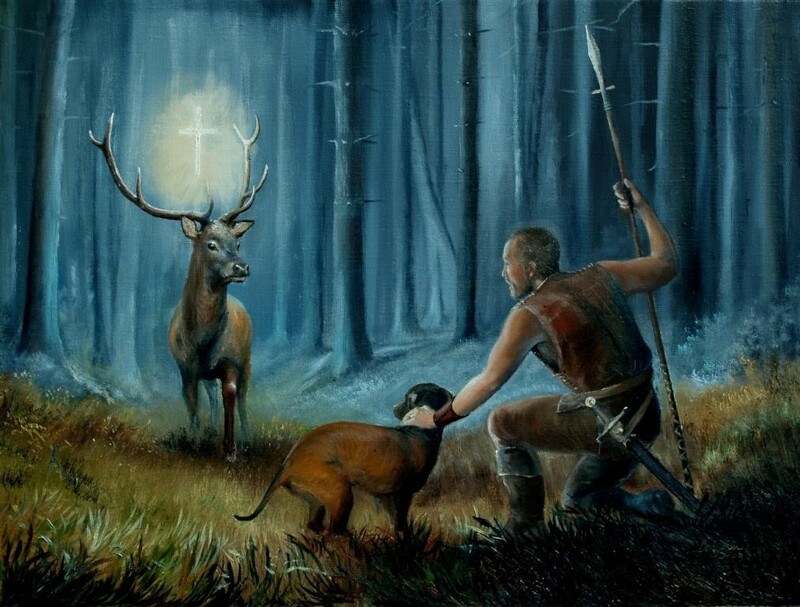 His feast day marks the formal opening of the hunting season in Europe. Somewhat akin to Robin Hood and St Francis, his legend is worthy of investigation. Hubert, was born in 638CE, the eldest son of Bertrans, Duke of Aquitaine, and naturally as his heir, became a prince in the House of Aquitaine in France. In 682, Hubert married into a powerful Merovingian family, taking Floribanne, daughter of Dagobert, Count of Leuven as his wife. Their son Floribert would later become bishop of Liège, though he nearly died at the age of 10 from a fever. Hubert was a seasoned and skilful hunter, spending much of his privileged life in the forests where, as legend has it, he had a vision that was to convert the pagan prince into a mendicant. 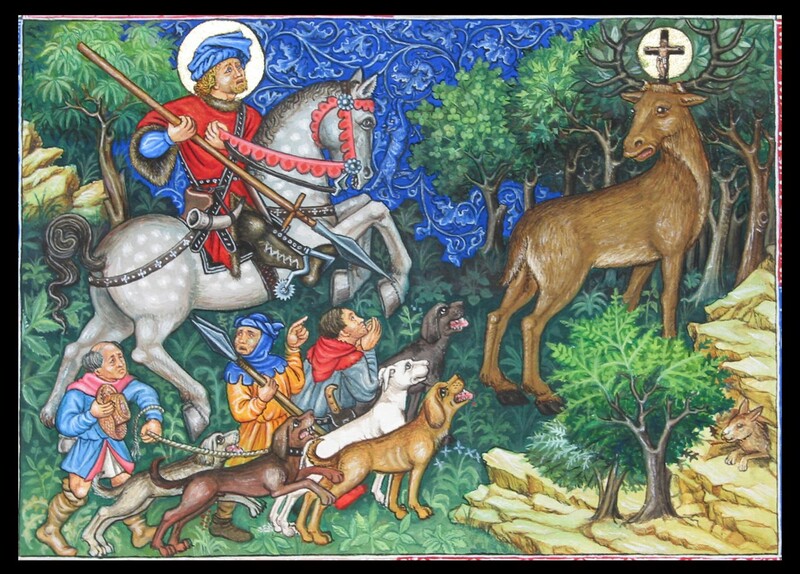 Seeking the familiar fauna of his hunting grounds, Hubert encountered a magnificent Stag; between its huge antlers he caught sight of the Holy Rood accompanied by a voice reprimanding his pagan ways. This profoundly affected Hubert causing him to renounce his privileged lifestyle. Rejecting even his title and his family, he gave up his birthright to the Aquitaine to his younger brother Odo, whom he made guardian of his infant son, Floribert. He distributed all his personal wealth among the poor, then studied for the priesthood. Hubert was quickly ordained, applying his passion for the forests and for the animals therein for his remaining years. Within his arboreal retreat, Hubert successfully established Christianity in large sections of the Ardennes forest of Belgium, stretching from the Meuse to the Rhine. He gave succour and wisdom to its many hunters and foragers there, establishing a hunting ethic adhered to still, especially his native regions across the Netherlands. Hunters rely heavily upon their dogs. Rabies, then a common problem decimated very quickly many prized hounds. Hubert was gifted with a natural immunity to this disease and also to cure its affliction to the unfortunate hound. 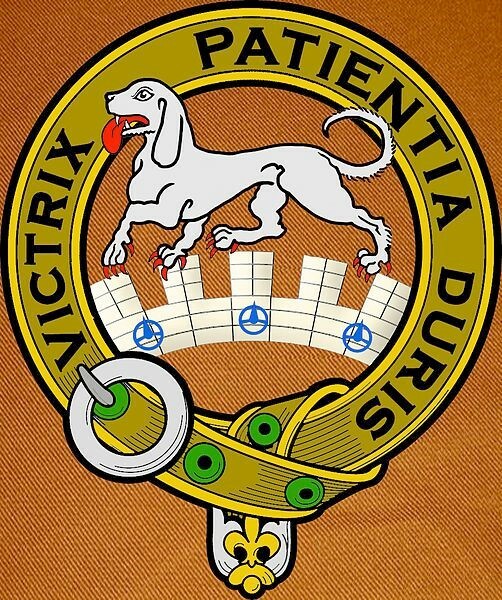 Due to his great love for the hounds, the monks of the St. Hubert abbey named a breed of hound after him – the ‘chien de Saint-Hubert’ in his honour. The breed, a forebear of the modern bloodhound was originally black or black and tan, medium-sized, and smooth-coated, with shorter legs, designed specifically for hunting boar. Rather curiously, it is believed this breed was later crossed with the Talbot Hound, a pure white hound, now extinct, to generate the modern bloodhound. 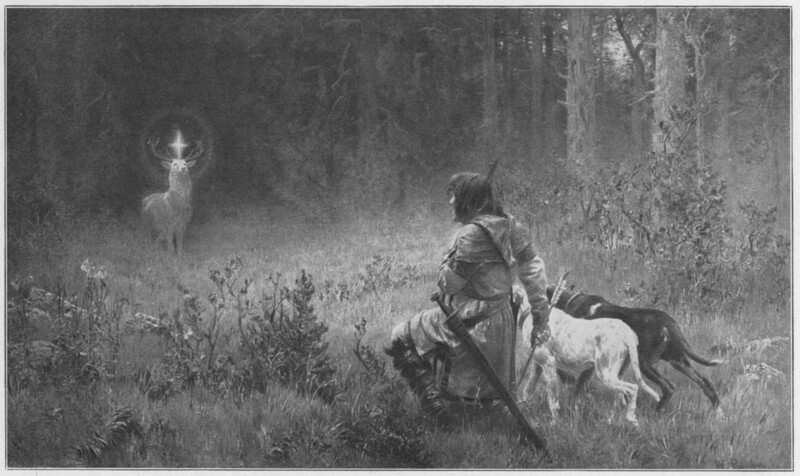 Again, a strange legend surrounding the white hunting hound that haunted the forests. Perhaps linked to the fae hounds of scarlet ear? 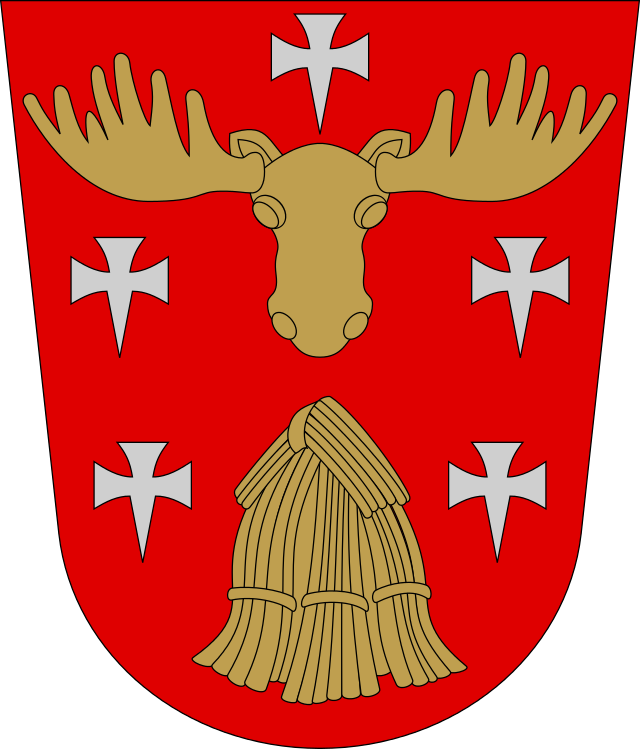 In the Middle-Ages, an Order of knightly brotherhood (Rittersbruderschaft), reflecting the overlapping religious and military aspects of medieval court life was established too in Hubert’s honour as the patron saint of hunters and knights. The founding of the Order of the Golden Fleece in the early 15th century started a trend in confraternal princely orders. The purpose of these, whether established by monarchs or princes, was to foster loyalty to a sovereign, replacing the old Chivalric orders developed in the Crusades. 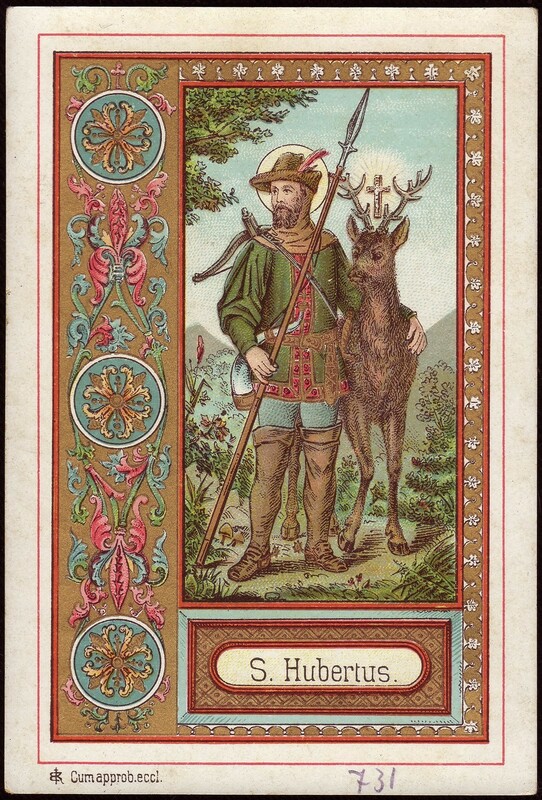 Both the Netherlands and Belgium claim saint Hubert as their own, holding a special Mass for him that celebrates sharing ‘mastellen’ before the hunt begins. This bread is akin to a cinnamon doughnut or bagel. There is an old folk rhyme for the blessed bread. It is a very special bread, some of which the hunter kept in his pocket to place into the mouth of the stag or hind as a final sacrificial meal to honour its passing – a tradition much upheld by those hunters today who observe still the ethic of St Hubert! ~ by meanderingsofthemuse on November 3, 2015.